To configure the external connections, move the cursor to the gear icon. 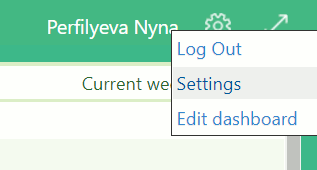 Then select “Settings” in the list. To configure the “white” list of IP addresses from which user connections were made, it is necessary to select the IP you are interested in and save. The information on disabled IPs will not be displayed in the External activity chart report. At the bottom of the list with IP-addresses is a panel with the number of pages, and you can choose how many items will be located on one page: 50, 100, 150 or 200.